A giant persistent photoconductivity (PPC) phenomenon has been observed in vacuum condition based on a single WO3 nanowire and presents some interesting results in the experiments. With the decay time lasting for 1 × 104 s, no obvious current change can be found in vacuum, and a decreasing current can be only observed in air condition. When the WO3 nanowires were coated with 200 nm SiO2 layer, the photoresponse almost disappeared. And the high bias and high electric field effect could not reduce the current in vacuum condition. These results show that the photoconductivity of WO3 nanowires is mainly related to the oxygen adsorption and desorption, and the semiconductor photoconductivity properties are very weak. The giant PPC effect in vacuum condition was caused by the absence of oxygen molecular. And the thermal effect combining with oxygen re-adsorption can reduce the intensity of PPC. One-dimensional (1D) nanotubes, nanowires, or nanorods have shown much higher sensitivity than bulk materials at room temperature because of their higher surface-to-volume ratio and stronger dependence of electrical conductance on the amount of adsorbates [1–5]. Their optical and electrical characterization is a direct way to gain a deep comprehension of some of novel phenomena of the nanostructure that originate from the overexposure of the bulk of nanomaterials to surface effects. Recently, the persistent photoconductivity (PPC) effect has been observed in ZnO nanowire , n-type GaN thin film , and rough Si nanomembranes . Persistent photoconductivity, which means that photoconductivity persists after the illumination has ceased and hindered the quick recovery of the initial unperturbed state, implies interesting applications in bistable optical switches [9, 10] and radiation detectors [11, 12]. Many methods are used to investigate the origin of PPC, including photoluminescence , optical absorption , photoconductivity , and PPC measurements . The kinetic mechanisms of PPC experiments are proposed by several groups. Some claims that this PPC phenomenon is related to metastable bulk defects located between shallow and deep energy levels. According to this assumption, oxygen vacancies can be excited to a metastable charged state after a structural relaxation . And others demonstrate that the PPC state is directly related to the electron–hole separation near the surface. The surface built-in potential separates the photo-generated electron–hole pairs and accumulates holes at the surface. After illumination, the charge separation makes the electron–hole recombination difficult and originates PPC . And the thermal and electric field effects have also been reported to reduce the intensity of the PPC [6, 7], simultaneously. However, there is no a widely accepted mechanism has been presented. In this paper, we fabricated a single WO3 nanowire device and presented a systematic study on giant PPC effect in vacuum condition. In addition, WO3 nanowire as a UV photodetector has been reported by our previous results . And no any decay current can be observed in absence of oxygen molecular atmosphere, and a gradually decay current can only be presented in air condition. The WO3 nanowire coated with 200 nm SiO2 layer can obviously reduce the photoresponse of the device. Moreover, the thermal and electric field effects cannot accelerate the decay current in vacuum condition. Based on these results, we thus conclude that the photoconductivity of WO3 nanowire is only related to the oxygen adsorption and desorption, the semiconductor photoconductivity of WO3 nanowire is very weak when compared to the surface effect, and the intensity of PPC effect is directly related to the oxygen molecular re-adsorbed rate. The WO3 nanowires were synthesized using a simple hydrothermal method in our previous reports . Tungsten powder and hydrogen peroxide were used as reactive materials, and the Na2SO4 was added to the solution as catalyst. Then the solution was sealed in autoclave and maintained at 180°C for 12 h. At last, high-purity WO3 nanowires were obtained. To characterize the photoelectrical properties of the WO3 nanowire, a single nanowire was assembled into field-effect transistor (FET) device using a standard photolithography. A parallel Ti/Au (10/200 nm) electrodes spaced about 2 μm apart were fabricated on a single WO3 nanowire, as shown in inset of Figure 1a. The UV photoconductivity measurements were performed under atmospheric and room temperature conditions with UV illumination (Spectroline handheld E-Series) and Agilent B1500A semiconductor Device Analyzer. The Ids–Vds curves of the nanodevices under dark and 312-nm UV illumination (~1 mV/cm2) were shown in Figure 1a. Under the dark condition, the nonlinear I–V characteristics reflect a back-to-back diode device. The current can increase from ~100 to ~300 nA after 200-s UV illumination. 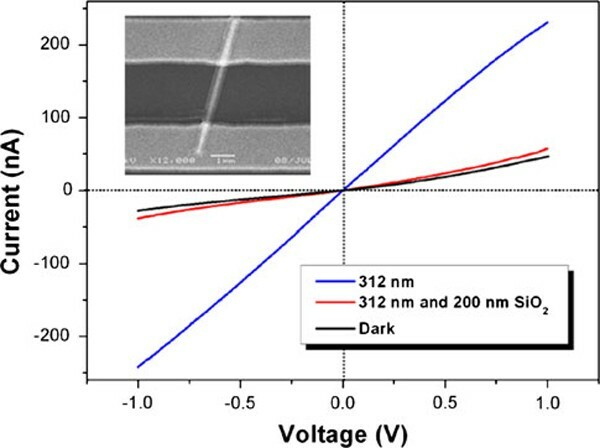 a The I ds – V ds characteristics of a single WO 3 nanowire under dark and 312-nm UV illumination (~1 mW/cm 2 ). The inset is an SEM image of a single WO3 nanowire device. b The persistent photoconductivity of the WO3 nanowire with Vds = 0.2 V.
In Figure 1b, the photocurrent can increase to ~30 nA with Vds = 0.2 V. However, no saturated photocurrent can be obtained, which maybe caused by the incomplete desorption of oxygen species on the surface of WO3 nanowire, similar to the ZnO nanowire as UV photodetector in Zhou's reports . The current is still about 17 nA after switching off the UV light more than 1.5 × 103 s, cannot recover to initial 2.5 nA, as shown in Figure 1b. That demonstrates the existence of obviously persistent photoconductivity in WO3 nanowire. With the decay time lasting to 2 h or longer, the current cannot back to the initial states. In order to observe the persistent photoconductivity of the WO3 nanowire in vacuum condition, we designed a vacuum chamber with a quartz glass window, which allows the UV illumination reach to the devices. When switching off the UV light in vacuum (0.1 mbar), the current can preserve a constant state (~13.5 nA) and hold more than 3.5 × 103 s without any decay, which presents a giant persistent photoconductivity phenomenon, as shown in Figure 2a. When the decay time was extended to 104 s, no decay current could be observed as shown in the first light off Figure 2b. However, once opening the chamber to air condition, a gradual decreasing current can be only presented, as shown in right side of the Figure 2a, b. It is noted that the duration of UV illumination is more than 3 × 103 s, and no saturated photocurrent can be observed as shown in Figure 2b. a The persistent photoconductivity of the WO 3 nanowire device under vacuum and in air conditions. b The persistent photoconductivity under discontinuous UV illumination. All the biases are 0.1 V.
To analyze the semiconductor properties of WO3 nanowire for the photoconductivity, a 200-nm SiO2 layer was deposited on devices using PECVD at 200°C to isolate the effects of oxygen absorption and surface defects. In addition, SiO2 was also demonstrated to be effective in surface passivation of nanostructures . A transparent SiO2 layer coating with the WO3 nanowire can be seen from the inset SEM image of Figure 3. No photocurrent can be observed in a control device, which is only coated with the same SiO2 layer between the two electrodes without any nanowire. With 200-nm SiO2 layer coating, the photoresponse almost disappeared as shown in Figure 3 (red curve), which is smaller than that of before coating (blue curve). The I ds – V ds curves of the device coated with SiO 2 under dark ( black curve ) and 312-nm illumination ( red curve ) and without SiO 2 coating under 312-nm UV illumination ( blue curve ), respectively. Inset is the device coated with 200-nm SiO2 layer. where g is the photogeneration rate of carriers per volume unit, and tbulk and tsurf are the lifetimes of the photocarriers recombined in the bulk and at the surface. In Figure 3, the SiO2 layer can suppress the oxygen adsorption at the surface of WO3 nanowire, and the photoresponse is only decided by the tbulk. But no obvious photoresponse can be observed. It implies that the recombination of photo-generated electron and hole pairs is completely dominated by the oxygen adsorption mechanism in the WO3 nanowires, and the band-to-band recombination mechanism from the WO3 nanowire can be neglected. In air environment, a ΔGph values (72 nS in Figure 1b) is smaller than that of in vacuum condition (112 nS in Figure 2a, 600 nS in Figure 2b). As an indirect gap semiconductor, WO3, the recombination of electrons and holes is through a recombination center (E t ) between the valence band and conduction band. The adsorbed oxygen molecular can be served as the recombination center at the surface of nanowire. Because of the absence of oxygen molecular in vacuum condition, the recombination of electrons and holes assisted by surface recombination center (adsorbed oxygen) cannot be occurred, and no decay current can be observed. So, only holes accumulate near the surface can recombine with electrons at the oxygen-assisted mechanism, which can explain the giant PPC phenomenon of WO3 nanowire in vacuum condition. Once the air is pumped into the vacuum chamber, oxygen species gradually re-adsorbed on the surface and captured these electrons, which results in a slow current decay in air condition. How to reduce the intensity of PPC? Recently, a high bias and a pulse electric field effects have been reported to accelerate the decay process [6, 7]. For the high bias effect, carriers gain thermal energy from high bias can easily overcome the built-in potential and accelerate the recombination photo-generated electron and hole pairs. For the pulse electric field effect, it will enlarge the capture cross-section of hole traps and increase the recombination rate. The similar results have also been presented for the WO3 nanowires. When we used a Vds = 1 V and switched off UV light, a faster decay current can be found as shown in Figure 4a. At the same time, a 5-V pulse with 100 s can lead to a sudden decreasing current as shown in Figure 4c. The photoresponse with bias 1 V in a air and b vacuum condition. 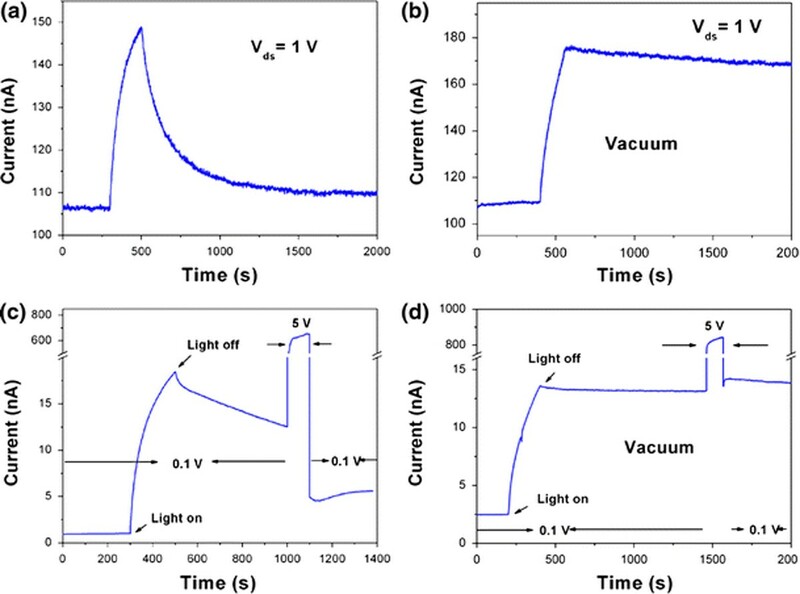 The persistent photoconductivity with 5-V pulse in c air and b vacuum condition. The bias is 0.1 V.
It is very interesting that we observed different phenomenon between in air and vacuum conditions. With the Vds = 1 V and switching off the UV light in vacuum, the current is in a constant state similar to that of the low bias Vds = 0.1 V shown in Figure 2a. Increasing the bias cannot accelerate the decay process in vacuum condition. Similarly, a five pulse voltage could not change the current as shown in Figure 4d. Here, whatever high bias or high electric field is applied, no decay current can be observed in vacuum condition. So, the thermal effect and electric field mechanisms fail to explain the phenomenon. Based on the results, we can conclude that under no high bias or high bias condition, the oxygen molecular always acts as a key role to decrease the current. In air condition, the higher current caused by high bias can increase the concentration of carriers and enlarge the conduction channel along the nanowires, and the more electrons can easily cross the depletion layer near the surface of nanowire and combine with oxygen molecular, which reduces the electrical conductance of WO3 nanowire. So, a "sudden" dropping current can be found when switching to a low bias as shown in Figure 4c. Opposite, there is an absence of oxygen molecular in vacuum condition as the recombination centers to decrease the current as shown in Figure 4d. Thus, a mechanism, combination of high bias and oxygen adsorption at the surface of WO3 nanowire, can perfectly explain the phenomenon. In summary, we have observed a giant PPC phenomenon of WO3 nanowire in vacuum condition. No decreasing current can be observed in absence of oxygen molecular atmosphere, and a gradually decay current can be presented in air condition. For the SiO2-surrounded WO3 nanowire, there is a very weak photoresponse in our measurements. The high bias and high electric field effects can accelerate the decay process in air, but not in vacuum condition. We can conclude that: (1) the photoconductivity of WO3 nanowire is mainly related to the oxygen adsorption and desorption, and the typical semiconductor photoconductivity properties of WO3 nanowire are very weak comparing to the surface effect; (2) the giant PPC effect is caused by the absence oxygen molecular as recombination center in vacuum condition, and the intensity of PPC is only depended on the oxygen molecular re-adsorbed rate on the surface of WO3 nanowires; (3) the thermal effect and oxygen re-adsorption can accelerate the decay current. This work is supported by MOE AcRF Tier2 Funding, Singapore. (ARC17/07, T207B1203).